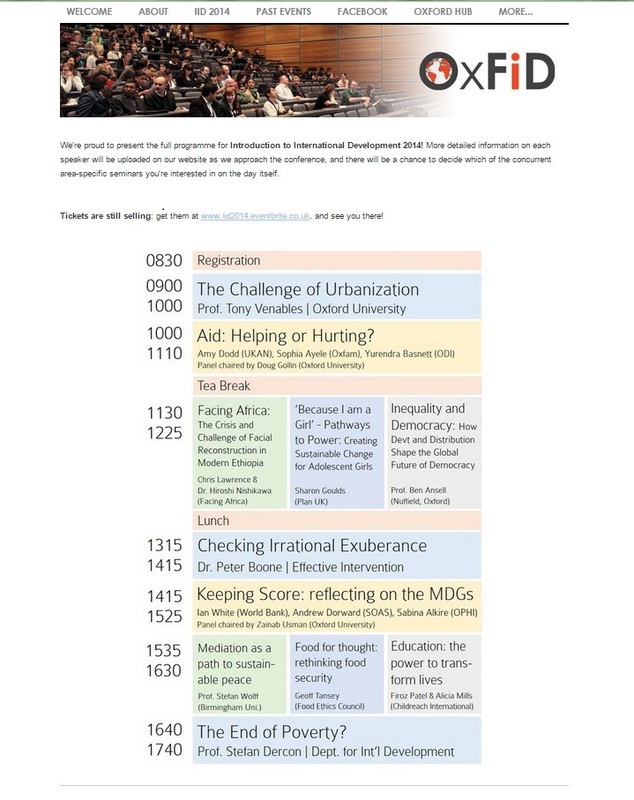 I have been invited by the Oxford Forum for International Development to chair a panel at the annual Introduction to International Development Conference. The panel I will be moderating is titled, ‘Keeping Score: Reflecting on the Millennium Development Goals (MDGs)’. The three panellists are: Ian White from the World Bank, Dr. Sabina Alkire of the Oxford Poverty and Human Development Initiative (OPHI) and Dr. Andrew Doward of the School of Oriental and African Studies (SOAS). Find out more information about the event and registration here, on the OxFID website. The conference is taking place on Saturday, 15 November 2014, at the Ship Street Conference Centre, Jesus College, University of Oxford, from 8.00 am to 6.oo pm. Well zainab, i hope you will shear us the vedio of the event. Sorry I couldn’t be there for the conference. I trust you will report on the discussions.